1. Seamlessly Connect with Customers, Suppliers or Partners. In the new digital world, remaining connected is crucial. Being able to access data and check emails or ongoing projects from a distance is a great benefit of incorporating cloud technology as part of a business model. The ability to access work-related activities from any device, in any location, makes answering customer help tickets or finding archived information quick and seamless. 2. A Globalized Workforce. With a cloud computing strategy in place, it becomes simple for your business operations to expand globally or allow employees to telecommute. With a large breadth of services available on the cloud, your infrastructure costs may drop, which saves resources and aids in team collaboration. A recent survey found this can lead to a 400 percent return on investment. 3. Monitoring Made Simple. Incorporating cloud computing systems into your business model also helps to improve productivity by making project monitoring simple. Many programs help you track progress and goals in real time so all work gets completed and prioritized properly. In addition, easy to use analytics software can cut down on employee workload, eliminating the need to provide your staff with advanced training to use specialized programs. 4. Focus on Your Specific Business Activities. 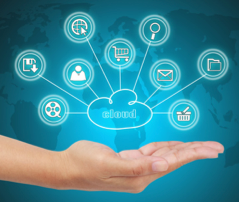 A major benefit of cloud computing is that the services and programs do much of the work for you. Rather than learning the complex ins and outs of each platform, which can include data storage, email operations or more, you can focus on the services which make your company unique. Use this benefit to take some of the responsibilities away from your team and placing them into the hands of cloud-based service providers. Using cloud computing services as part of your business model can help you focus on core competencies and the offerings you do best. Being able to seamlessly connect with customers, expanding globally for a low cost and simple monitoring are all benefits you’ll gain when you incorporate some of these platforms into your strategy. Are you ready to move your business to the cloud? Contact us today; WEI is ready to help.